Transport: tourist bus and boats (motor & row boats). Honey bee farm, seasonable fruits garden. Coconut candy shops, trees along canal. 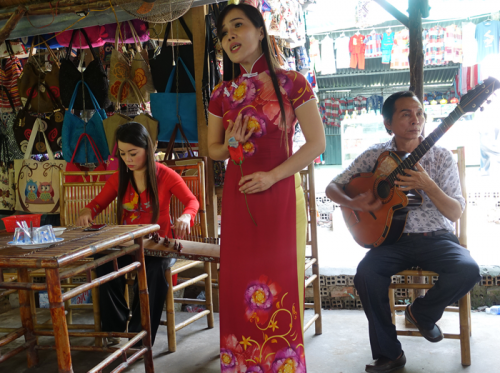 Enjoy traditional music with weared "ao dai or ao ba ba dresses" girls. Transport: boat and tourist bus. Take a look Cai Rang floating market. On foot to reach a noodle and a rice paper factories. 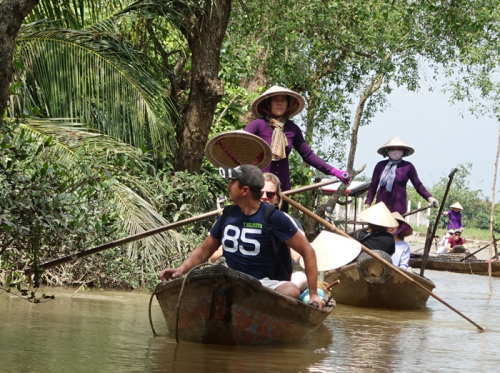 Two days Mekong Delta tour (My Tho-Ben Tre-Can Tho) holds everyday - Enjoy the experience of local river life, tradition and culture, and have the opportunity to see the biggest floating market in Can Tho. 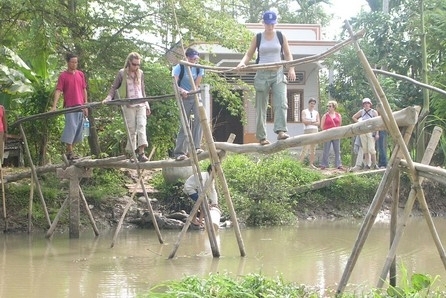 Mekong Delta 2 days tour will be the highlight of our trip to Vietnam. Seasonable fruit garden + bee farm + coconut candy workshop, folk music and small cannal. 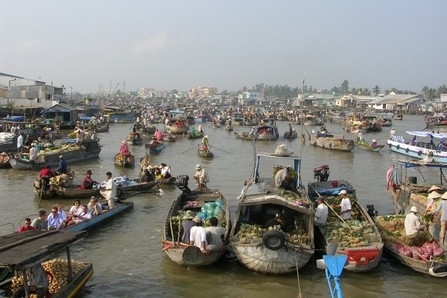 The larggest Cai Rang floating market. 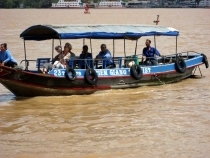 08.00am, Mekong Delta tour from Ho Chi Minh 2 days - travel by bus/car to My Tho. 9:30am - 10.00am, arrive in My Tho. Board a wooden motor boat (20 minutes) to Unicorn Island. On this boat along the river’s bank, you’ll be passing through natural creeks, interesting fisherman's port; stilt houses (half on land, half on water). From there, we’ll take you to a bee farm where you have a chance to taste a tasteful cup of authentic honey tea. After that we walk around quiet villages and watch the life of rural people in Mekong Delta. Things get small and personal now. We are divided into many groups (if you take group tour) and get on small row boats. During this 15 minutes trip, you’ll witness all kind of interesting transportation modes that local people use to move around, while enjoying the fresh air along the canal and beautiful water coconut tree scenery. Away from the city, that is it all about! When you feel it's enough for the serenity, let's get back to the large motor boat for something different. You'll cruise a canal whose 2 long sides are orchards (seasonable orchards). After that, we cruise to a village where the sweat smell coconut candies are in the air. To satisfy your curiosity, we'll get to a village that has many small shops that make coconut candy and handcrafted items from coconut trees of Mekong Delta. You might learn that those people can amazingly make dozens of useful products out of coconut trees. It is indeed inseparable from the villagers' life. Now let's have a lunch the restaurant. 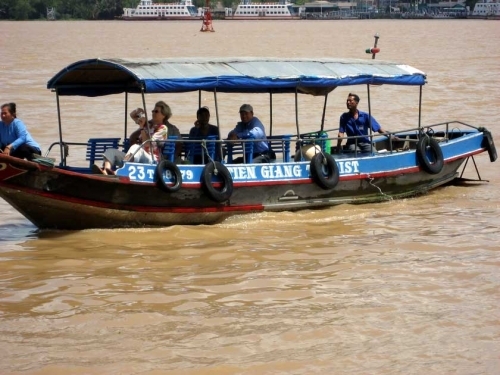 As your journey ends, you will return to My Tho by motorized boat and then travel to Can Tho. Check-in hotel and stay overnight in Can Tho. Transportation: Air con tourist bus. Guide: English speaking guide in tour. Standard type - mini hotel: 1 lunch and 1 breakfast. Superior type - 2 stars hotel: 2 lunches, 1 dinner and 1 breakfast. Deluxe type - 3 stars hotel: 2 lunches, 1 dinner and 1 breakfast. Luxury type - 4 stars hotel: 2 lunches, 1 dinner and 1 breakfast. V.I.P Type - 4 stars++ hotel: 2 lunches, 1 dinner and 1 breakfast. Hotel: As mentioned in "hotel" part. Mineral water: 02 Aquafina water bottles/2 days. 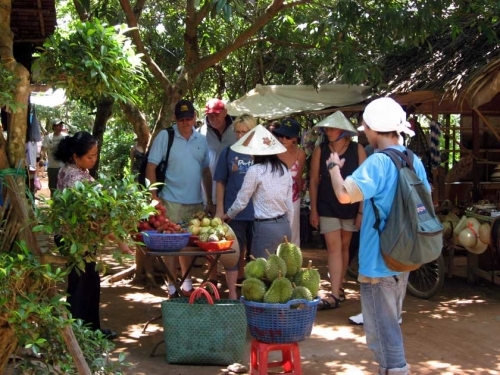 Fruit, honey tea, entrance fees and accommodation in Can Tho. 02 Aquafina water bottles/2 days. Tips, drinks, personal expenses, travel insurance and drop off at your hotel in Saigon/Ho Chi Minh for standard, superior and deluxe types but you can choose "drop off hotel request in Dist 1" to be dropped off. With luxury and VIP types, we will free pick-up and drop off at hotel with mentioned hotel addresses in "Meeting Point" Part. Bus schedule from Can Tho to Rach Gia: depart from 8am to 18.30pm (per hour per bus). It takes 3,5 hours - 4 hours. Boat schedule from Rach Gia To Phu Quoc: we have 8am and 13pm. It takes 2 hours and 30 minutes. Please provide name of hotel and hotel address in Dist 1, HCMC, Vietnam where we can be free pick-up by email sales@vietfuntravel.com or call us + (0) 909 759 479. Please bring your passport for check-in hotel in Can Tho (Mekong Delta). If your hotel's location is on these streets such as De Tham St, Bui Vien St, Pham Ngu Lao St, Le Lai St, Le Thanh Ton St, Bui Thi Xuan St, Pham Hong Thai St, Thu Khoa Huan, Nguyen An Ninh St, Cong Quynh St, Ly Tu Trong St…Dist 1, HCMC, Vietnam, we will free pick-up from your hotel at 07.40am - 07.55am (please provide your hotel address and the name of hotel where you will stay at). Mentioned addresses exclusion, please come to Viet Fun Travel Office (28/13 Bui Vien St, Pham Ngu Lao Ward, District 1, HCMC) at 07.20am - 07.30am.